This insane clip from Tom Coronel’s buggy shows just how crazy and brutal the Dakar Rally can be. Even the recoveries are insane. Coronel’s buggy got stuck in the fesh fesh—fine nightmare sand that sometimes acts like quicksand—on stage 3 of the rally. 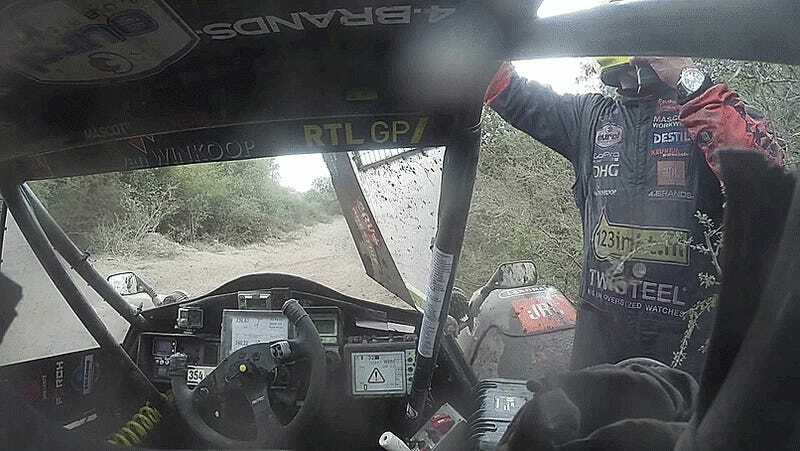 Unfortunately, the road through that section was so narrow that a couple competitors couldn’t make it through without running into Coronel’s stuck buggy. The scariest hit-and-run was the fault of one of the massive trucks, which several eagle-eyed race fans on Twitter identified as the number 514 Iveco. Shortly thereafter, another large truck paused to take Coronel’s buggy out of the deep sand. Skip ahead to 2:15 for the recovery. Not only does Coronel not even have time to shut his door and properly belt-in his buggy before he gets going, but he gets his helmet on just before a big plop of sand comes in. Mind you, most of the major endurance road racing series throw a fit if a racer is still fiddling with or tightening their belts in the pit lane, much less putting them on entirely and hoping your vehicle stays straight while you quickly put on your helmet. Dakar: not for the weak.